But & and and have distinct functions, meanings, and uses. Worse, writers commonly and casually overuse & as a fully interchangeable equivalent of and. That’s why we assembled this easy list of ampersand usage rules. The tendency to overuse & has worsened as less formal digital communication (texting, email, Twitter) exploded requiring character shortcuts, which are now the norm. But using & as convenient shorthand in regular or formal business prose strikes like nails on a chalkboard—and it makes authors look careless. 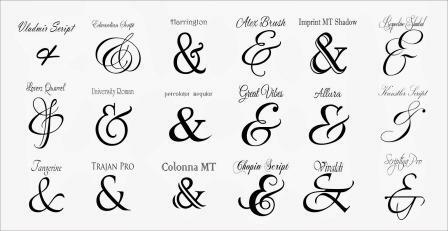 Do you know the rules for ampersand use? Ask 10 business people if they know of the rules for ampersand use and you’ll likely find that nine of them don’t know that such rules exist, much less what they are. Ampersand usage is a style detail many people don’t think important enough to merit attention. After all, if most people don’t know the rules, who will notice if you screw it up, right? Unfortunately, it’s little details like proper ampersand use that can make your writing look or feel clunky or dumb, even to readers who don’t know exactly why. The ampersand usage rules are simple. First Rule: Generally, don’t use the ampersand in regular text, headings or titles as a replacement for and. Just don’t—except as noted in the second rule. Proper nouns like company names, e.g., “Crown & Co.” (note: spaces are used here). When logos, titles, or names contain the mark as a design element. In titles of creative works such as novels, songs, and albums. In film credits for stories, screenplays, etc., & indicates a closer collaboration than and. The Writers Guild of America uses & to denote two writers collaborating on a specific script. Inside tables or parentheses when space is limited. The ampersand can be used to indicate that the “and” in a listed item is a part of the item’s name and not a separator (e.g. “Rock, pop, rhythm & blues and hip hop”). In names that are themselves abbreviations, like “AT&T” or “A&W” (note: no spaces are used here). The phrase et cetera (“and so forth”), commonly written as etc., is also properly abbreviated &c. — representing the combination et + c(etera). That’s it. Follow these simple ampersand usage rules, and consult your appropriate style handbook to ensure conformity with standards governing your work, and you’ll avoid trouble. Next Next post: Em Dash, En Dash, or Hyphen (Dash)?